ALL FIVE HAVE BEEN SENT AN E-MAIL AND HAVE 48 HOURS TO RESPOND. RANDOM.ORG WILL BE USED TO CHOOSE NEW WINNERS IF ANY OF THE WINNERS DO NOT RESPOND. THANKS TO ALL THOSE WHO ENTERED AND IF YOU DID NOT, THIS BOOK IS WORTHY TO PURCHASE AS IT REALLY IS A WEALTH OF PRACTICAL, GREAT INFORMATION! 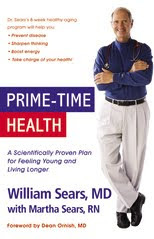 Prime Time Health by Dr. William Sears and Martha Sears is a must have at any age. Once I picked up the complimentary book I received from Hachette Book Group, I couldn't put it down. I have recommended it to all my family and friends as the must have book to stay healthy and get healthier. Dr. Sears packs the book with practical advice as well as advice he researched by talking to other experts in the various fields. Having a chance to look at the personal purpose that drove Dr. Sears to write the book adds credibility to what he is trying to teach. Dr. Sears is a cancer survivor and has been able to incorporate all that he learned while facing that life threatening diagnosis while sharing it with all of us. His practical advice and information is logical and is backed by science. Dr. Sears also has a site for promoting better health with children. It's the Bible for living well! The book was created in sections to help guide the reader into understanding how to follow the plan for prime time living. He provides useful and healthy recipes that will get you started on the right track. This is not another book based on minimal research or backed by some nutritional health company. This is full of first hand knowledge, research and experience. With Dr. Sears' Prime Time Plan, you will feel better, perhaps live longer and can help promote wellness among everyone in your circle. I highly recommend this book for better health and a chance to turn around your wellness at all ages. Five winners will get a chance to have this must have book. Follow my blog and go to Hachette Book Group and tell me what other book looks interesting. Giveaway ends 2/6 at midnight. Winners will be chosen by random.org. I'm a follower & love Dr. Sears' books! As for what I'd choose, I had no idea that Peg Bracken's books were once again available for purchase. Her 'I Hate to Cook...' books crack me up. So I would choose: The I Hate to Cook Book By Peg Bracken. "Marriage and Other Acts of Charity" really looks like something that I would love to read! I follow through google friend connect. Six Pixels of Separation also looks interesting! I follow you. I would LOVE to read the Book "I am Ozzy". I LOVE him!!! I entered your Flirty Apron Giveaway. I follow your blog. I looked at the bestseller list for Hachette Book Group and they are publishers for the Twilight series (lucky dogs) and The Lovely Bones. I've read both and the are really good. Two other books, I Alex Cross and Dear John look good. This is a great book! I would love A Baby's Garden--what a neat idea for the gardening mom. I'd like to read The River. I would love to read Roses by Leila Meacham , thanks! I'd like to read The Impostor's Daughter. "False Convictions" by Tim Green! I would like to read The Waxman Report by Henry Waxman. I'd also love to read Nicholas Spark's The Last Song. The Wife's Tale by Lori Lansens looks really good! The Waxman Report by Henry Waxman looks very interesting! I entered the MyPleasure contest. "The Swan Thieves" looks interesting. I follow you on google. I am a google follower and would love to read the Book "I am Ozzy".